You’ve only got access to one outlet from the house 3 blocks down the street by a very long extension cord. No problem, your whole production should be able to run off that one outlet, right? How much can you plug in before you flip the breaker? How do you even turn it back on if it does flip? Today, we shall answer these questions and many more in our basic guide to electricity for filmmakers! Electricity is made of electrons. Electrons are kind of like your crew as you read this article aloud to them…they want to get as far away from you (and each other) as they can as soon as possible! Usually, when people discuss electricity, they use water pipes as a visual analogy, but I’m tired of that. Let’s go with your cast and crew instead. Your cast and crew are electrons. Voltage is a measure of your team’s pent-up frustration with being crammed into a small shed for your shoot (the shed is the electrical outlet). The more people on your team, the more frustrated they get. (with 50 Hz or 60 Hz alternating rate, but we’re not going to discuss AC vs. DC in this article). When you finally call cut and open that shed door, the rate at which your team come rushing out to get some fresh air (that shed smells bad) is the current (I, measured in Amps or A). But, even if there are tons of people jammed into that shed, they can only leave through that one exit, so the size of that exit door is going to restrict the flow of people (the current). The size of that door is the resistance (R, measured in Ohms or Ω), where a big R means a small door and a small R means a big door (confusing, I know). Although that is the common mathematical form, it’s a little easier to think of that equation in another form for our analogy, I = V/R. That is, the number of people streaming out the door is equal to how many people are pushing to get out divided by the difficulty of getting out of the door (remember, big R means small door and small R means big door). In our example, power could be thought of as the amount of heat and friction we generate at that doorway. If lots of people are squeezing through that door and it’s a tight squeeze, we generate more heat. In electrical terms, that heat is the energy we use to power our device. It might manifest as actual heat (as in a toaster) or light (as in a light bulb), for example. We describe Power in Watts. While everyone who escaped from the shed is eating on their lunch break, you can sneak into the basement and find the breaker box. I currently live in a very small apartment, so my breaker box looks like this. 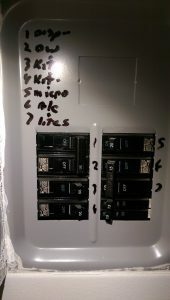 Most properties will have bigger breaker boxes with more circuits on them. Specifically, each breaker corresponds to an isolated circuit that can handle a certain draw of current. You will notice that breakers are labeled mostly these days with 20 Amps. That is the maximum current that can flow through that circuit before the breaker will flip off. Most breaker boxes will also have a master breaker for a whole building. These are typically 200 Amps. That means, for all of the circuits in the entire building, the total current that can flow through all of the circuits is 200 Amps. These limits are useful because they help prevent fires! When lots of electrons flow through a wire, they can cause it to heat up. The thicker the wire, the easier it is for the electrons to flow without heating up the wire. Proper home wiring is then typical designed to handle at least 20 Amps of current without the wire heating up and causing a fire to start in your walls (when you hear the term “electrical fire” thrown around, this is what it is referring to usually)! This is a complex question. First, let’s consider a single circuit connected to a single breaker. Depending on how your house is wired, a single circuit can mean one outlet or it can mean many outlets. There is quite a lot of variability on this. Either way, let’s consider one circuit. We know that a circuit breaker will flip if more than 20 Amps current flows through it. So, let’s check out your lights. How much current do they draw? Most devices do not list current draw, but rather list power in Watts. 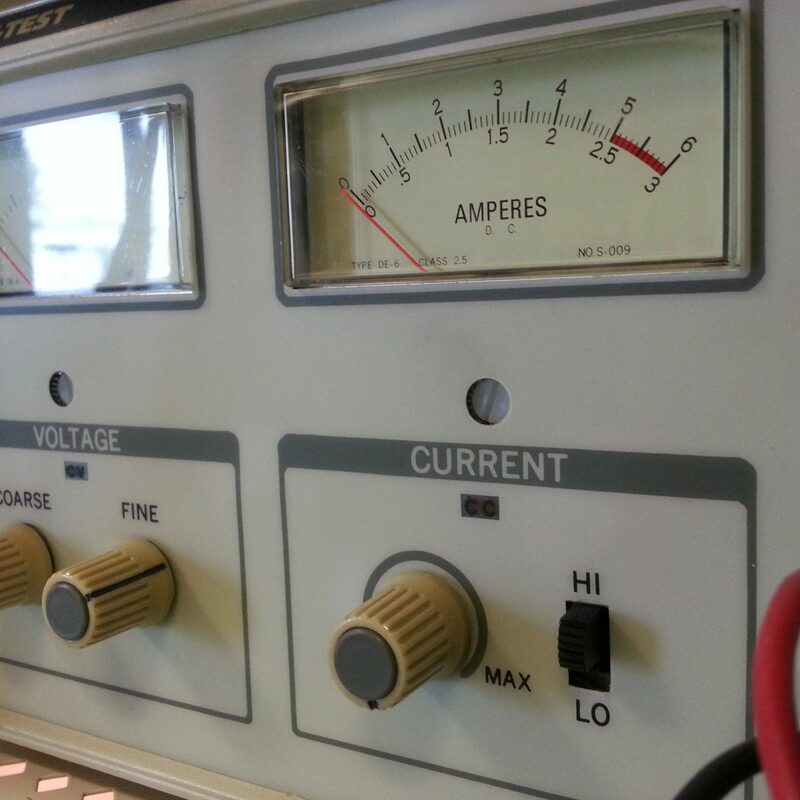 Power in Watts equals voltage times current! So, for a 20 Amp, 120 Volt circuit (like most US systems), the maximum power is 2400 Watts. That means you can plug in devices that consume up to 2400 Watts of power before the circuit breaker will flip. When we talk about lights, we usually describe by power, such as 1Ks or 2Ks. That means that these lights will consume 1000 or 2000 Watts, respectively. So, you could plug two 1K lights into a single circuit (for a total of 2000 Watts), but could not plug two 2K lights, or even a 1K and a 2K into the same circuit without flipping the breaker. Most people have experience flipping a circuit breaker by running two kitchen appliances simultaneously. 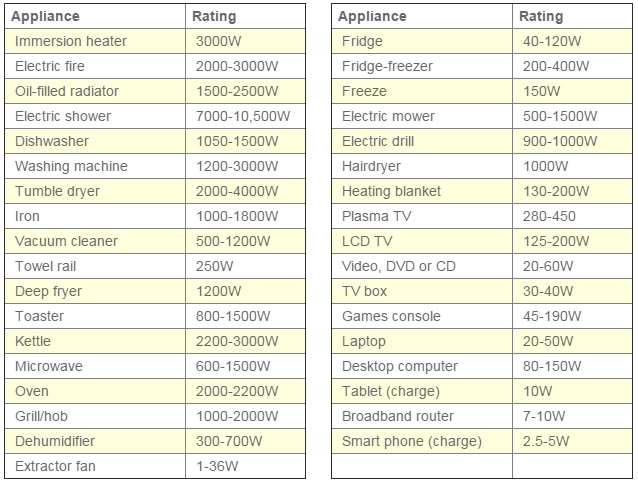 Both microwaves and toasters can be 1500 Watt or more. So, if you turn on two 1500 Watt devices plugged into the same outlet, you will attempt to draw too much current. If you solve for this, you will find that I = 25 Amps. This is too much current and your circuit breaker will flip to prevent the wires in your kitchen from overheating and starting a fire. Note: Some breakers may be 15 Amps, so total power will scale accordingly! How can I tell if two outlets are on the same circuit? Sometimes, breaker boxes will be labeled to indicate the rooms or outlets that they serve electricity to. More often, there are two simple ways to check to determine which breaker an outlet is on. Method 1: Plug something in to the outlet, turn it on, flip the breakers off until you find the one that shuts it off. 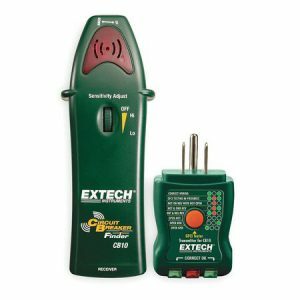 Method 2: Use a breaker finder (circuit tracer). When we set up to shoot TEN at Beach Mansion, we knew we would need a lot of power for some scenes, so upon arrival, our gaffing / electric crew immediately tested and labeled every outlet in the house with a breaker finder. This is done by plugging one part of the device into the outlet and running another part of the device near the breakers in the basement to transmit and receive a signal. 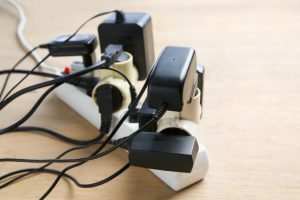 Once you know which outlets are wired to a breaker, you can make sure that the summed power for all of those outlets does not exceed maximum wattage. While 20 Amp breakers are rated for 2400 Watts, electrician Steve Walther (of the awesome Steve Walther Orchestra) tells me that in the electrical trade, maximum loads are calculated as 80% of the breaker rating. So, for a 20 Amp breaker (rated at 2400 Watts), the maximum load would be 1920 Watts. So, if you do use a 2000 Watt light, you should not have anything else on the same circuit. When we were filming TEN, we knew we needed more power than available in a single room. So, once our outlets were labeled, we ran thick-gauge extension cords throughout the house to get power from multiple circuits into a single room. Thicker wires can carry more electrons (more Amps) without heating up. Because the world is a confusing place, wire gauge ratings are lower numbers for thicker wires and higher numbers for thinner wires. So a lower-rated-gauge wire can safely carry more current than a higher-rated-gauge wire. Always check the labels on your cords for ratings! These are typically listed in Amps. 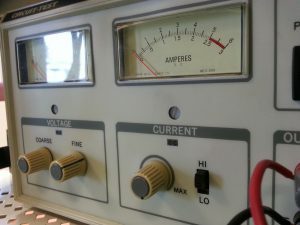 Ratings are affected by the gauge of the wire and the length of the cord. You might be confused now. Your cord is rated in Amps, but your light is rated in Watts. Your cord will need to be rated for at least 12.5 Amps (and you shouldn’t cut it that close) in order to handle 1500 Watts. My advice: don’t ask for trouble! Very long cords can also cause a drop in voltage, which will reduce light output for certain types of light bulbs, and can cause bigger issues for other electronic devices that require exact voltage. Using a larger gauge cord (lower number) will offset this. One long cord is more efficient and offers less resistance than two (or more) shorter cords totaling the same overall length. The fewer times you connect extra cords in a pathway, the better. What if I’ve flipped the breaker? First, power down and unplug anything that shut off when the flip happened. Head down to your breaker box and take a look. You should see one breaker (or more) that is in a different position than the others. You will need to push the breaker all the way into the off position (the opposite position of the other breakers) and then back to the on position (the same position as the other breakers). NEVER HOLD THE BREAKER IN THE ON POSITION! IF IT WON’T STAY ON, YOU COULD HAVE A SHORT CIRCUIT AND HOLDING IT ON CAN CAUSE AN ELECTRICAL FIRE! CONTACT A LICENSED ELECTRICIAN IF YOU CAN’T GET THE BREAKER ON. Otherwise, the breaker should lock into the on position and you can return and turn your devices back on, but don’t consume so much power this time! Zap! No access / No Time? Now you know how to calculate the maxmimum power loads for your circuits and you can safely make decisions about lighting and other electrical systems. But what if you’re in a hurry or you don’t have access to the electrical system where you are shooting? In these scenarios, we always stick with having a low power footprint. We have taken to using LED light panels that use 20-75 Watts of power. That way, even if we were to plug in 20 panels, we would still be in no danger of flipping a breaker.